The RenStar was built on ESPN2’s Chopper Nation and though the platform is a metric cruiser, RenStar will take it to the streets proudly against any modified street bike on the 405 freeway. 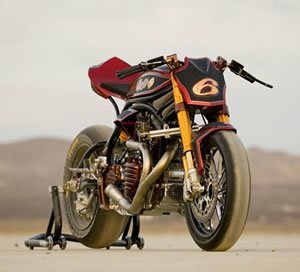 With an Öhlins racing suspension, Vance and Hines racing exhaust, Dunlop racing tires and a Patric Racing massaged powerplant RenStar pounded the pavement at the Willow Springs Raceway. The RenStar uses a Patrick Racing 1854cc Star V-twin, just the thing for huge power with low end grunt, plus an inverted fork, aluminum swingarm and rearsets instead of forward controls.